ColecoVision.dk Homebrew Section Presents: Eduardo Mello, Opcode Games. Eduardo Mello is born in Brazil and lives now in the States of America, he is already a pioneer in programming games for ColecoVision. Eduardo sells his games via the name OpCode Games or via a publishing label. He started with the Atari 2600 and MSX, but turned quickly over to the ColecoVision. He also have interest for Atari 7800, and the NES. "I was a big MSX user during most of the 80s"
He took fairly quickly out of that some of the games for ColecoVision was closely related to Sega SG-1000, and the first MSX machines. Eduardo is very well with the things, and he is very thorough, and he looking at the details again and again, until he is satisfied with its outcome. The story actually dates back almost 30 years. Eduardo had a friend in school and his family was very wealthy, so he had all the latest consoles, including the ColecoVision (big deal if you take into account we were in Brazil). So even before Eduardo had got his first console he already wanted to make games (Suppose TRON also played a big part on that). Eduardo and his friend then created a fictional game company called C&B Software, and they had plans for making games for the Atari 800. So it is too bad that Eduardo didn't keep all the game sketches he made back then, though he believe he still have a sketch for his arcade controller from circa 1985. Amazing that Eduardo designed that thing before even seeing similar controllers. And it was very well thought, even including an expansion port on the right side, with clips to hold a secondary controller. Anyways, a couple of years later Eduardo and his friend parted ways (he moved to another town) so Eduardo was left to follow his dreams on his own. Eduardo then go into the MSX, and C&B Software became Coin-Op Software, a name Eduardo used until 2002. C&B means Caio & Baia. Baia was Eduardo's nickname in school. Caio was his friend's name. He insisted to use Baia instead of Eduardo because according to him it would sound cooler than C&E. And he also insisted that they should use C&B, and not B&C, even though Eduardo was supposed to be doing all the programming. His father was involved with licensing Star Wars in Brazil and Eduardo dreamed that they could get a license. In college Eduardo got really into classic gaming, but at that point he was more interested on the Atari 2600. It was hard for Eduardo to find any info though. Then the internet came and info was widely available. But there were other hurdles Eduardo had to overcome. Eduardo clearly wanted to make arcade ports, however classic arcades were no longer available in his area, and programming from memory didn't seem like a viable option to him. Around 1996 the first arcade emulators started to appear, so Eduardo decided to finally start working on something. He selected Space Invaders because He thought it would be the easiest (in retrospect, don't think that was necessarily true). Eduardo checked the code and hardware specs, and noticed that it was quite similar to the MSX/ColecoVision architecture that he was so used to. So Eduardo elected the ColecoVision as his platform of choice, because he was really into consoles at that point. And so development on Space Invaders Collection started, around 1996/1997 with a few codes. Eduardo stopped and resumed numerous times due to college and then because he got his first job. Unfortunately. Eduardo got disenchanted with the computer field while he was in college. In fact he almost quit the course twice. It took him 9 years to graduate. as they were a bunch of geeks and nerds that loved to talk about programs and algorithms while they were having lunch. Eduardo felt that they had to be crazy. Not too far from the Computer Science department was the Physics department, and Eduardo made some friends there. They spend the afternoons talking about movies, books, comics, games, art, science, whatever but damn analysis of algorithms and stuff like that. Eduardo says he still have nightmares about his college days. Eduardo met his first wife in 2001, and for some reason that motivated him to finally finish the Space Invaders game. In 2002, when Eduardo was about to finally release it, he concluded that having a website was important, so he started to look around on how to register a domain. For his despair the Coinop.com domain was already taken, as was coinopgames and coinopsoftware. So Eduardo started looking for another name, and the idea of opcode came to him. 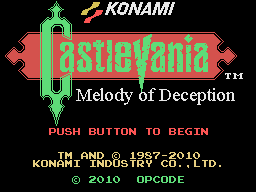 The name sounded great because it was the same size and almost an anagram of coinop, and also because it related to software creation. From Space Invaders Collection part 1. 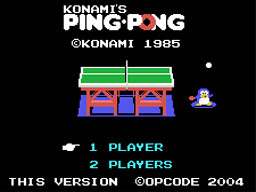 (U.S. color version) Eduardo's first Ping-Pong version in 2004. (Prototype). Eduardo's 2nd. version in 2010. Most famous is his former site: this one. It's about Space Invaders Collection. Eduardo's biggest hit was, and is undoubtedly Space Invaders Collection. 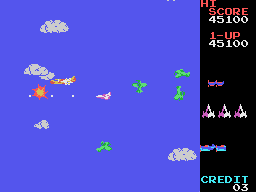 (Space Invaders U.S and Japanese and Space Invaders Deluxe U.S and Japanese). He started to program the game in 1999 and after 10 years including his college, was the game finally ready to meet the ColecoVision fans all over the world. The game sold 100 copies the first day, and have a total sale close to 200. The game will be re-released in 2017 as an SGM version which including improved sound, savegame features and a few ajustments. Eduardo's oldest site was called: "Coin-Op Games". And it was hosted on Eduardos college's server in Brazil. The main page had this MSX like cursor keys that you could click on to navigate. There were pages for the ColecoVision with entries for Space Invaders, Pac-Man, Atari, Odyssey2 and Intellivision. Eduardo threw his love and like on Konami's MSX games. Eduardo made some games, most relevant one was probably a port of Mario Brothers, but Eduardo don't think any of that has survived. 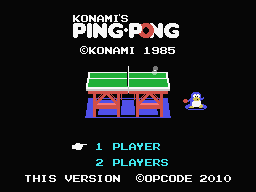 Another of Eduardo's first MSX attempt was Konami's Ping-Pong. He released a partially completed prototype in 2004, this means that the game was not ready, but almost done. 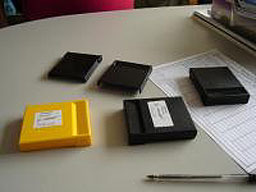 There exist a few prototypes out there in cartridge format. Also in 2004 began Eduardo on Sky Jaguar, and he made a playable demo. Sky Jaguar was also finished later that year, but was not for sale. "Sky Jaguar was the first game "I got for my brand new Sharp HotBit." 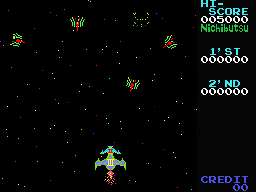 Sky Jaguar did not sell so well, it was measly 18 copies on the first day via AtariAge. Mayby because of the choppy background. 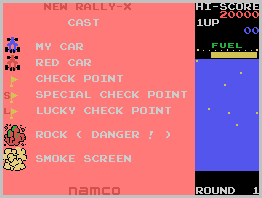 At approximately the same time in 2004 began Eduardo to reprogram the MSX version of Road Fighter to our ColecoVision. 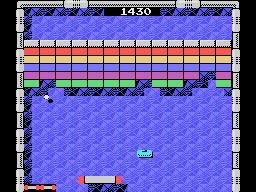 It was actually a friend in Brazil who had started on the project, and Eduardo finds quickly that Road Fighter was overfilled with at least 2 Kb. So there had to be optimized a lot. It should prove to be a long affair, and Road Fighter was finally completed in February 2008. This game sold very well. Now was Eduardo a very busy man, and he began really to get involved in the programming the games for ColecoVision. So he also made a perfect translation of the Konami game: Yie Ar Kung Fu. 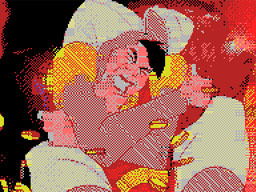 Yie Ar Kung Fu also contains the MSX version in the same ColecoVision cartridge, so 2 versions of the game. 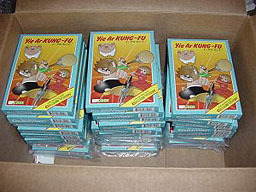 Yie Ar Kung-Fu -and a lot of them, ready to go. Opcode Games sold 200 copies of that game. He is almost a perfectionist, and a very respected programmer, and I am convinced that this is what makes Eduardo's games really cool. Coleco Industries did not have these details in their games back in 1982 to 84 as Eduardo have now a days. Making cartridges in the 80's was very expensive and a MegaCart didn't even exist at the time. The details are what counts in the end for a game just like Eduardo's. Eduardo launched a really good MSX game for ColecoVision: Magical Tree, and this game is simply fantastic. A really good gameplay and the playing catch you. The sound and melodies is perfect, and keeps indeed the mood up. 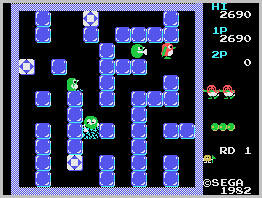 Also in 2004 began Eduardo programming on a newer Pac-Man version for ColecoVision. It should not just be a Pac-Man game, but also Puck-Man, Ms. Pac-Man and Pac-Man Plus, and all that in one single cartridge. Eduardo programmed his games close to Arcade perfect, so that would say in both versions of course from Namco and Midway. Eduardo has recycled some of the old codes from the original arcade games from 1979 to 1982. Eduardo prefer to do all things on his own way. That means programming the game, PCB's and the cartridges for his games, but some help with the graphics that could be made by others. And with help from friends in Brazil gives a game just the final touch. Eduardo had previously a Brazilian factory to produce its cartridge shells with the Opcode logo on the backside. 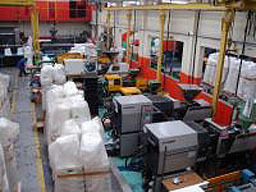 Production hall and some carts, the yellow cartridge was for the first Pac-Man Collection. Eduardo hired Dale Crum at Doc4Design to design his boxes, and manuals for his games. That also includes the labels, it's a very good professional quality totally, no doubt about that. Eduardo hired in 2007 Bryan Edewaard to produce a completely new PCB to his own Opcode cartridges. 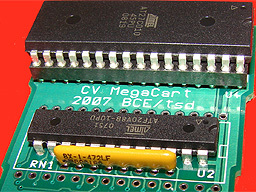 It was called MegaCart, and can in principle provide games from 32, 64, 128, 256, 512. and even up to 1024 Kb. It was never been seen before, and it's a first class work. PMC was the first game ever that using the MegaCart. 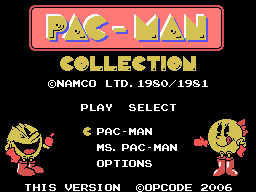 There was sold 290 copies of Pac-Man Collection. Around 80 of them in yellow cartridges and 210 in black carts. A new MegaCart2 PCB has now seen the daylight, and this time with a new name namely: Super Game Cartridge. 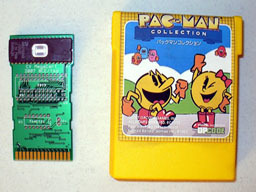 The Super Game Cartridge is a kind of media cartridge, and allowing games to be larger than 32K. Provides very advanced bank switching and EEPROM save game functionality, each cartridge will save its own data. Eduardo has also completed until more games, but some of them will not run in a normal ColecoVision. They require an extension to the ColecoVision, a so-called memory (RAM) expander. The name for this one is the: Super Game Module. Eduardo will go further with this, he will together with other friends in Brazil develop an entirely new console. This console will in 2019 work with ColecoVision games and ColecoVision games with SGM features. The new is that Eduardo will develop new games that only can run on the: Super Game System. Many of the programmed games by Eduardo will never see the day light as a launch, as Eduardo did not think these games is good enough for a true sale. And some of those games have been sold through ebay, where people bid like crazy. Exerion, Galaga and Comic Bakery for ColecoVision, all prototypes, 15 games sold for at least $ 500,- each. Also a few Super Game Modules with a milky white shell is sold for a very high price on ebay. Why ! because only few units exists in that color. You can also use ColecoVision Super Games on ADAM Family Computer System. But ColecoVision Super Games will require the Super Game Module if the game also use the extented sound. Eduardo program and sells many of its games through CollectorVision Games and Team Pixelboy. All new games from Opcode Games label sells now through the AtariAge.com Store. Examples on converted games, and this time from Sega SG-1000. Eduardo have converted at least 10 different SG-1000 games, and most of them is being published via Team Pixelboy and few for CollectorVision Games. Eduardo has almost completed DKA, in a new CV version. The project has been stationary for some years, because Eduardo works on and off oh this. DKA is so faithful as it can be, compared to Coleco's version from 1982. Eduardo use the arcade version for the game and scale everything down 3/4 on the y axis. DKA has it all, and that includes "How high can you get", the springs in the elevator scene, and the missing factory scene. You got all details, also high-score and the game will be so close to the original sound as it can be. DKA even includes a scoreboard for the 5 best players. Bonus for DKA is the Japanese version also is included. DKA is only for use with ColecoVision with the new Super Game Module. And over the years also for the Super Game System. DKA should be available in 2019, and it will be released together with the upcoming ColecoVision clone Prometheus Lite late in 2019. Games Eduardo more or less is started on, or have plans on. None og them is just not finished yet. DKA - Arkanoid - Moon Patrol - Pengo and Moon Cresta, but also - Maze Of Galoius and Salamander. will all be released in a near future.